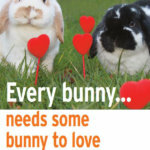 RWAF recommend that pet rabbits are neutered and kept with another friendly rabbit. In our experience a neutered male / female pair works best. They are social animals and suffer from stress when kept without the companionship of their own species. All major welfare organisations in the UK agree with this advice. Remember also that rabbits and guinea pigs are not suitable companions. Both species are social but need to be bonded with members of their own species. We often hear that people think that their rabbits are happy alone, and can not be bonded. In our experience of over 20 years of rescue and bonding this is very rare. More likely the reason that rabbits do not bond sucessfully is because they are not introduced property or because those two particular rabbits are simply not compatible. There is a lot of advice out there, but not all of it is based on fact. We pride ourselves on providing up to date and correct information. Bordetella bronchiseptica is a bacterial infection of the upper respiratory tract of a number of species, including dogs, rabbits and guinea pigs, related to B pertussis, which causes whooping cough in humans. It is often described as commensal in rabbits (ie found in this species without causing harm), however, it can be a primary disease causing organism, and can complicate other infections such as Pasteurella. It can, though, be fatal in guinea pigs, and so keeping them in the same airspace as rabbits is not advised. Rabbits and Guinea pigs have different dietary requirements, particularly guinea pigs’ need for Vitamin C.
Rabbits and Guinea pigs are not the same species, and cannot respond appropriately to one another’s behaviours. This may result in inadequate social behaviours, up to and including severe bullying.